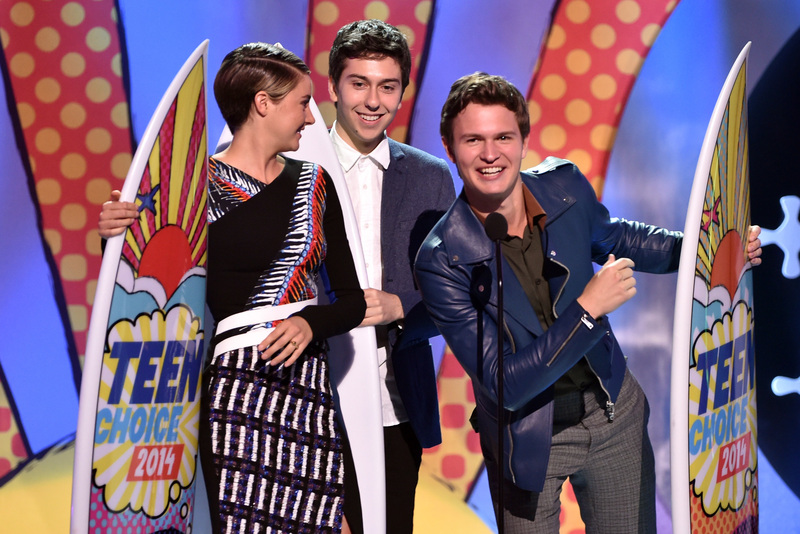 Shailene Woodley and Ansel Elgort of "The Fault in Our Stars" rode a victorious wave at the Teen Choice Awards. The actors were honored with several prizes at Sunday's fan-favorite extravaganza, including choice drama movie actor and breakout movie star for Elgort and choice drama and action movie actress for "Divergent" star Woodley. The pair was also awarded the surfboard-shaped trophy for choice movie lip-lock for their "Fault in Our Stars" smooch. "I don't surf or anything, so I guess I'm gonna put this on my wall," said Elgort of the unique prize. Demi Lovato kicked off the Teen Choice Awards with a performance and a win. After belting out her tune "Really Don't Care," the singer-actress surfed away with awards for choice summer song and choice female summer music star. Lovato used her acceptance speech to pump up the crowd of mostly roaring teenagers. "I want you guys to know that instead of just getting up here and saying a speech, every single one of you deserves to have a happy and incredible life, so be the best you can be in everything because your dreams can come true if you work hard for them," beamed Lovato. Teen Choice Awards co-hosts Tyler Posey of "Teen Wolf" and Sarah Hyland of "Modern Family" said 165 million votes were cast online for the 16th annual awards, which honor movies, television, music, comedy, sports, fashion and Web stars in such silly categories as choice hottie, smile and villain, which went to "The Hunger Games" heavy Donald Sutherland. "You named me the most villainous?" asked Sutherland, who showed up to the casual ceremony in a tuxedo. "My wife -- I have been married for 42 years -- my wife asked me to tell you that she agreed with you." Other winners on hand to claim their trophies included "Pretty Little Liars" star Lucy Hale as choice drama TV show actress, "The Hunger Games" co-star Josh Hutcherson as choice sci-fi/fantasy movie actor and Bethany Mota and Tyler Oakley as choice female and male Web stars. "You're all amazing," said Mota, echoing the motivational acceptance speeches from this year's batch of winners. "You all have the potential to be what you wanna be." A recent water main break flooded the Teen Choice Awards' original venue at UCLA's Pauley Pavilion. The show was hastily moved across town to the Shrine Auditorium adjacent to the University of Southern California campus. Zendaya, Ariana Grande and Kevin Hart were among the other stars who showed up to accept awards at the boisterous ceremony, which featured performances from the groups Magic and Rixton. "I wish there was a TelePrompTer for these (acceptance) speeches," said "The Giver" actress Odeya Rush, who won the breakout star award. Jason Derulo closed out the show with a performance of his song "Talk Dirty," which featured the choice male summer music star winner dancing on top of a police car on stage. Choice Movie Actress (Action): Shailene Woodley, "Divergent"
Choice Movie Actor (Sci-Fi/Fantasy): Josh Hutcherson, "The Hunger Games: Catching Fire"
Choice Movie Actor (Drama): Ansel Elgort, "The Fault in Our Stars"
Choice Movie Actor (Comedy): Kevin Hart, "Ride Along"
Choice Movie Breakout Star: Ansel Elgort, "Divergent" and "The Fault in Our Stars"
Choice Movie (Drama): "The Fault in Our Stars"
Choice Movie Villain: Donald Sutherland, "The Hunger Games: Catching Fire"
Choice Movie Chemistry: Ansel Elgort, Shailene Woodley & Nat Wolff, "The Fault in Our Stars"
Choice Movie Liplock: Ansel Elgort & Shailene Woodley, "The Fault in Our Stars"
Choice Movie Scene Stealer: Nat Wolff, "The Fault in Our Stars"
Choice TV Show (Drama): "Pretty Little Liars"
Choice TV Actress (Comedy): Lea Michele, "Glee"
Choice Summer TV Star (Male): Tyler Blackburn, "Pretty Little Liars"
Choice TV Reality Show: "Keeping Up with the Kardashians"
Choice TV Breakout Show: "Faking It"
Choice TV Reality Personality: Cat Deeley, "So You Think You Can Dance"
Olay Breakout Star: Odeya Rush, "The Giver"